March 23, 2016 – Did the “man in the moon” look different from ancient Earth? New NASA-funded research provides evidence that the spin axis of Earth’s moon shifted by about five degrees roughly three billion years ago. The evidence of this motion is recorded in the distribution of ancient lunar ice, evidence of delivery of water to the early solar system. This interdisciplinary research was conducted across multiple institutions as part of NASA’s Solar System Exploration Research Virtual Institute (SSERVI) based at NASA’s Ames Research Center in Silicon Valley, California. 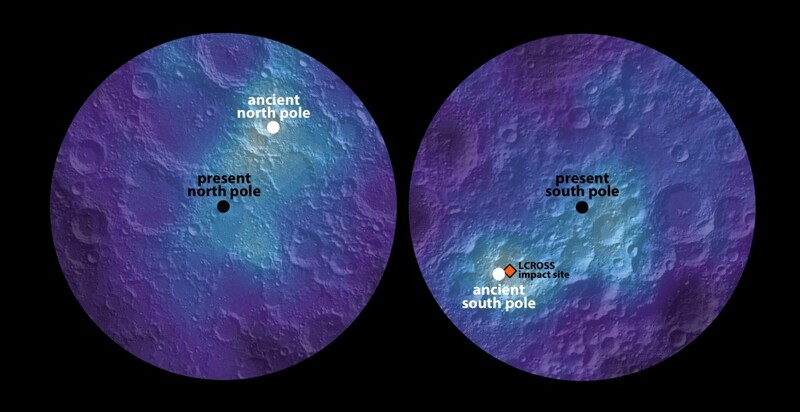 Water ice can exist on Earth’s moon in areas of permanent shadow. If ice on the moon is exposed to direct sunlight it evaporates into space. Authors of the Nature article show evidence that a shift of the lunar spin axis billions of years ago enabled sunlight to creep into areas that were once shadowed and likely previously contained ice. The researchers found that the ice that survived this shift effectively “paints” a path along which the axis moved. They matched the path with models predicting where the ice could remain stable and inferred the moon’s axis had moved by approximately five degrees. This is the first physical evidence that the moon underwent such a dramatic change in orientation and implies that much of the polar ice on the moon is billions of years old. The authors analyzed data from several NASA missions, including Lunar Prospector, Lunar Reconnaissance Orbiter (LRO), Lunar Crater and Observation Sensing Satellite (LCROSS), and the Gravity Recovery and Interior Laboratory (GRAIL), to build the case for a change in the moon’s orientation. Topography from the Lunar Orbiter Laser Altimeter (LOLA) and thermal measurements from the Diviner lunar radiometer – both on LRO – are used to aid the interpretation of Lunar Prospector neutron data that support the polar wander hypothesis. Siegler noticed that the distribution of ice observed at each of the lunar poles appeared to be more related to each other than previously thought. Upon further investigation, Siegler – and co-author Richard Miller of the University of Alabama at Huntsville – discovered that ice concentrations were displaced from each pole by the same distance, but in exactly opposite directions, suggesting the spin axis in the past was tilted from what we see today. A change in the tilt means that some of the ice deposited long ago has since evaporated as it was exposed to sunlight, but those areas that remain in permanent shadow between the old orientation and the new one retain their ice, and thus indicate what happened. A planetary body can shift on its axis when there is a very large change in mass distribution. Co-author James Keane, of the University of Arizona in Tucson, modeled the way changes in the lunar interior would have affected the moon’s spin and tilt. 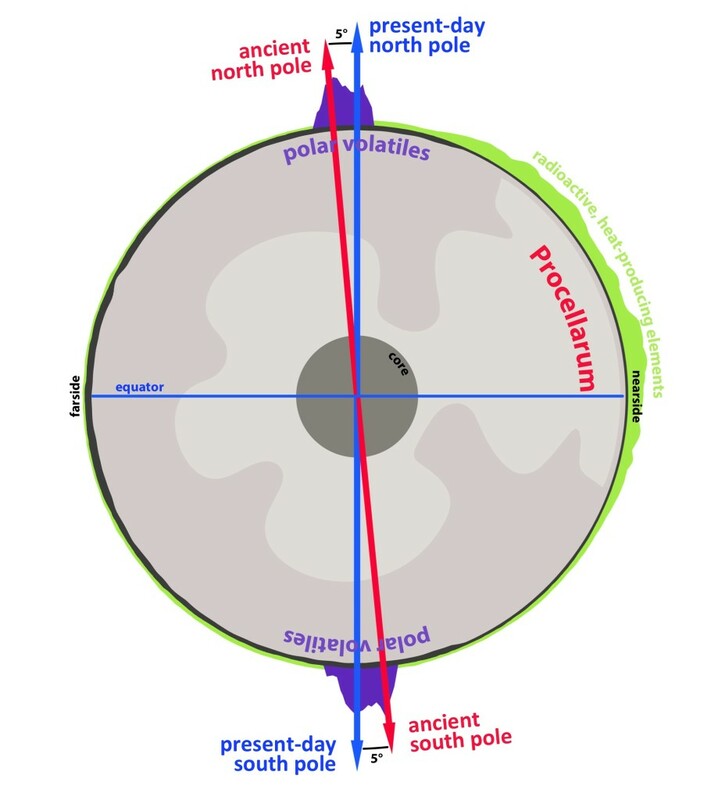 In doing so, he found the Procellarum region on the lunar near-side was the only feature that could match the direction and amount of change in the axis indicated by the ice distributions near the poles. Furthermore, concentrations of radioactive material in the Procellarum region are sufficient to have heated a portion of the lunar mantle, causing a density change significant enough to reorient the moon. Siegler, Miller, and co-author David Lawrence of Johns Hopkins Applied Physics Laboratory in Laurel, Maryland are part of the Volatiles, Regolith and Thermal Investigations Consortium for Exploration and Science team, one of nine teams funded by SSERVI.